The word “optimal” is being ignored. Optimal does not mean “evenly distributed,” not even a little. In fact, “optimal” can mean one thing to one person and the exact opposite to another–with good reason. For example, a college student or a mother of a newborn cannot remotely pursue her social and lifestyle potential for some time. The perfect balance for an entrepreneur is more like a jet airplane on the runway. The entrepreneur must be full throttle to get off the runway, perfect their trade, develop customers and get to a safe cruising altitude before tray tables come out and drinks are served. 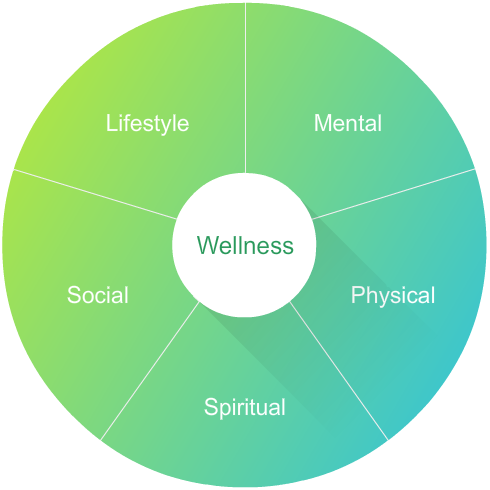 Since the optimal balance is different and dynamic for each of us at different times of our lives, how do we define wellness for ourselves and where do we start pursuing it? I’d argue that a great place to start is with the simple things. Here’s a modified version of one of my favorite quotes inspired by Jim Rohn, adapted a bit for the subject matter. It’s really quite easy to take steps towards wellness. Common sense would suggest doing the easy things first too, which include avoiding the pitfalls. Any self improvement efforts towards a higher state of wellness is a positive thing as long as you’re not ignoring a major destructive imbalance in favor of improving aspects of lesser impact. While this is not a complete list of pitfalls or recommendations, it presents three aspects in each of the five dimensions of your life that equate to fifteen things that you can reflect on to see if you’re doing enough of the easy stuff. I realize the list isn’t necessarily exciting, but these are the simple ones that can help you reach for higher and higher levels of wellness each year. You can literally get better with age! This is my list of basics to keep in mind.